Representatives of the Norwegian Agency for Quality Assurance in Education (NOKUT) and the Norwegian Universities and Colleges Admission Service (NUCAS) have made a study trip to Eritrea in October last year to access the conditions of higher educations in the country as well as to honor recognition if they met the standards and criterion. In their subsequent report released last week, the group expressed their total amazement in the distribution of higher education in Eritrea. These findings will lead to changes in NOKUT’s valuations when it comes to recognition of higher education from Eritrea. The University of Asmara has been the only institution of higher education in the whole country. All issues related to higher education have been concentrated around the university. To be able to offer higher education to a larger number of students, the government decided to close the University of Asmara, with no new intake of students after 2003. Then they upgraded seven of the underlying colleges of the university to independent institutions of higher education. Some of the new colleges have also been moved to other parts of the country, and one could say that there has been a decentralisation of higher education in Eritrea. The result is that Eritrea today has seven institutions offering higher education, and the number of students attending programs of higher education has risen from around 5000 students at the University of Asmara in 2004 to around 17 000 students attending programs at the new colleges of higher education today. The University of Asmara’s main programme were the diploma programme and the bachelor degree; and was only able to introduce the master degree programme in 2004 just before closing. Today we see that most of the new colleges of higher education have already introduced many new master degree programmes or are planning to introduce master degree programmes in the near future. The State of Eritrea is an isolated country on the Horn of Africa, with approximately 5 million inhabitants. This small African country was an Italian colony from 1889 to 1945, and since 1952 a part of Ethiopia. After almost 30 years of war, Eritrea became independent in 1993. Since independence it has been run by one party, the People’s Front for Democracy and Justice (PFDJ), with Isaias Aferwerki as president of the country. The system of education is fully controlled by the state, and programmes of higher education are overall planned and developed to serve the needs of the country. Until 2004 the University of Asmara was the only higher education institution in the country. Then the government decided that higher education should be available to more people, and a reform was implemented during the years 2004-2010. It is important to start by saying that this is not a reform changing the system of higher education itself, but a reform that changed the number of institutions from one to seven institutions. As a result of this reform, the number of students in higher education institutions has increased from around 5 000 students attending classes at the University of Asmara in 2004 to approximately 17 000 students in 2012 attending higher education programs at the new colleges. The University of Asmara was established by Italian missionaries in 1958 and has been the only higher education institution in Eritrea. The University had its last intake of students in 2003, and the last batch of students graduated from the university in 2007. The University offered 2-3 year diplomas and 4–5 year bachelor degrees in most fields. The University also introduced the master degree program in 2004 for a few students already enrolled at the university. The system in Eritrea with 2-3 year diploma programmes, 4-5 year bachelor degrees and the 2-year master degrees is the same both before and after the reform, with the exception of a 6-year program in medicine that has been introduced after the reform. The government decided to close the University of Asmara, with no new intake of students after 2003. The students that were already studying at the university were allowed to finish their degrees. The government then established seven new colleges to take its place. These new colleges were already functioning as parts of the University of Asmara, but with the reform they became independent institutions of higher education. This reform took place in the period 2004–2010. The new colleges were expected to offer higher education to a larger number of students than the University of Asmara had been able to admit, and they were therefore moved to different parts of the country, such as the coastal town of Massawa and Adi Keih in the south. The main reason for this change of location, according to the government, was to make higher education more accessible to students outside of the capital. In addition, it was necessary to build larger teaching facilities which corresponded to a greater number of students, as well as to find housing for these students, as the lack of sufficient housing was considered a general problem in Asmara. Each college covers a specific subject area. For example engineering is only offered at Eritrean Institute of Technology and medicine is only offered at Orotta School of Medicine and Dental Medicine. The colleges offer 2–3 year diploma programs, 4–5 (6) year bachelor degree programmes, and some are offering or planning to offer different programmes on a master degree level. The master degree is a 2-year program. As the master programme was only introduced in 2004, just before the closing of the University of Asmara, it is still a fairly new degree in Eritrea. For this reason, just a few of the colleges have experience with the master degree and it takes time to develop these new degree programmes. For more information on the master degrees, please see page seven. According to the information we got during our meetings with the National Board of Higher Education (hereafter referred to as NBHE), there are plans to phase out the diploma programmes and establish junior colleges for diploma programmes only. However, NBHE did not give any further details as to when and how this is to be implemented. As per today (academic year 2012–2013), all seven colleges still offer diploma programmes, and there seem to be more students attending the diploma programmes than the degree programmes. According to available articles and other information, this is the trend for all colleges. Out of the 122 graduates from the College of Marine Sciences & Technology in 2011-2012, 72 graduates were on the diploma programme and only 50 graduates were on the bachelor degree program. One should note that the freshman year of the diploma programme and the bachelor degree programme are the same. 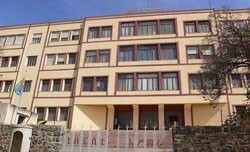 The Eritrean Institute of Technology (EIT) is the largest of the seven higher education institutions today and had its first intake of students as an independent institution as early as 2004. The following information is for the academic year 2011/2012. These are all 5-year programs. There are ten diploma programs within the same areas being offered at the College, and these are all 3-year programs. There are just two diploma programs in this college. These are in Computer Application and Archives & Record Management. The bachelor degree programs are 4-year programs, and the diplomas programs are 2-3 years. The College of Science also has four different master degree programs in Biology, Chemistry, Mathematics and Physics. These are 2-year programs. The College of Health Science offers diploma programmes, bachelor degree programmes and a few master degree programmes. The School of Nursing used to be a vocational institution called the School of Nursing and Health Technology. The school was administered by the Ministry of Health and offered diploma programs and certificates. The diploma programmes offered at the school were vocational programmes and not a part of the higher education system. However, in 2008 the school was incorporated into the College of Health Science. The diploma programmes were upgraded by the College of Health Science and considered higher education. If the Final Diploma and the transcript clearly indicate College of Health Science as “teaching institution” it is higher education. If it only says School of Nursing and Health Technology, then is it probably an older diploma and it should not be regarded as higher education. Please see page seven for more information on the vocational diploma programme and a diploma programme considered as higher education. After 2008 the college does not offer certificates, as certificates are not part of the higher education system. The School of Pharmacy offers a 5-year program (Pharmacist) and a 2-year diploma program in the same field. There are also plans to offer a Higher Diploma degree in four different areas. Until 2006, the higher education sector was managed directly from the Ministry of Education. To coordinate the reform in higher education after the closing of the University of Asmara, the Provisional Committee for the Coordination of Higher Education was established. The committee worked to facilitate and coordinate the activities of the new higher education institutions. After two years (2006–2008) it ended its work and was in 2008 replaced by the NBHE. The last president of the former University of Asmara, Dr. Tadesse Mehari, is today the Executive Director of NBHE. Its mission is to promote higher education in the country, oversee the education being provided by the institutions and the quality of education, oversee the functions of the governing bodies of these institutions, and to manage accreditation of new programs and new institutions. It has three sub-offices to execute and manage the main objectives of the board. These sub-offices are the Bureau of Standards and Evaluation, the Bureau of Higher Education Administration and the Bureau of Administration and Finance. In 2009 the Bureau of Standards and Evaluation developed a set of guidelines for accreditation of higher education institutions. These guidelines are planned to serve as a basis for quality assurance in higher education institutions in Eritrea. The guidelines are to be used for monitoring and evaluating the quality at both public and private institutions. Accreditation can be given at both institutional level and programme level. As of October 2012, there are no private institutions accredited as institutions of higher education in Eritrea, but we were informed that a college called SMAP Institute of Education, Training and Consultancy has applied to NBHE for accreditation. SMAP offers certificate- and diploma programmes. The NBHE strives to promote the new higher education institutions as centers of excellence according to their guidelines. However, in our meetings they expressed some concerns about the quality of education, as they now have less “control” of the education being provided, as higher education in Eritrea has been decentralised and is not only offered in Asmara. With more students in higher education and programs being offered in different parts of the country, it is regarded as more difficult to follow up the quality of teaching and the curriculum, according to NBHE. The institutions we visited, the Eritrean Institute of Technology and the College of Health Science, were of the opinion that the quality of education was being maintained, even though they were facing challenges with the increased number of students. The lack of teaching staff was mentioned as the main problem. In our meeting we were informed that the government has solved this problem by “importing” teachers, mainly from India. In 2012, 35-50 % of the teaching staff came from abroad. This is supposed to be a temporary solution, as the government has plans in progress to educate national staff, both locally and on different exchange programs in India, China, the US and Germany, to name a few countries. Nevertheless, this will take time, due to the political situation in the country, many of the nationals joining these educational programs abroad never return. Eritrea currently has a diaspora of about 1.5 million. The students in higher education pay no tuition fee. All expenses for housing and food are covered by the government, and most students live in dorms on the university campus. Books can be borrowed at the university library. A diploma program offered by any higher education institution in Eritrea is to be considered as higher education. These diploma programmes are 2- and 3-year programs, depending on the subject. Most diploma programmes offered by higher education institutions can be incorporated in a bachelor degree when the total amount of credits for the subjects corresponds. Most commonly this is done within the same subject area. For holders of a diploma education, it takes 2–2½ years to complete an ordinary 4-year bachelor´s degree. Most bachelor degree programmes have a normative length of 4-years. The exceptions are few, but one should mention engineering, law and pharmacy, which are all 5-year programmes. Also, the 6-year bachelor of medicine is important to include. Until recently, general medicine was not offered in Eritrea at all. All doctors had to be educated abroad. However, the Orotta School of Medicine andDental Medicine has been able to offer a 6-year bachelor of medicine the last couple of years. A 4-year Bachelor degree is usually 130 – 150 credits in total. Both diplomas and bachelor degrees are offered as extension programmes. These are usually part-time programmes taken as evening classes. The normative length of a 4-year bachelor degree is seven years on an extension programme. The master degree in Eritrea is a 2-year programme. The first year mostly consists of classroom courses, and the second year is almost fully dedicated to research related work and the writing of a thesis. As the master degree level was introduced as late as 2004, in the subjects where this level is offered, only a very small number of students have graduated. When the issue was discussed during our visit to the Eritrean Institute of Technology in Mai Nefhi, its representatives mentioned 3-4 students enrolled in each programme. Hamelmallo Agricultural College planned to introduce four master degree programmes in 2012. In the first year there will be 5 – 6 students in this programme. The College of Marine Science and Technology will start offering master degree programmes in 2013. As part of the country’s plan to educate more students, there are plans in place for a so-called “fasttrack master degree programme”. This means that master students of different subjects follow the same classes in the first year, and then specialise and write a thesis in their specific subjects during the second year. This programme was to be offered from 2011 at the Eritrean Institute of Technology, but these plans have, according to the NBHE, been delayed. There are also a couple of colleges which offer distance learning on the master degree level, where the students live at the college in Eritrea, but have distance education “classes” at the Indian institution via Internet. During our visit to Eritrea, we did not visit any of the institutions offering vocational training. However, we were informed by the NBHE that there are a number of schools offering teacher training (for primary school teachers), nursing, accounting and some administrative subjects. All these schools are administered by the appropriate ministry, such as the Ministry of Health or Ministry of Education. Schools offering vocational training have 1-2 year certificate- and 2-year diploma programmes. The certificate is never considered higher education, as mentioned earlier. Neither is a diploma programmeoffered at these schools. These diplomas are vocational programmes for people planning to be employed by the ministries. The programmes are also offered as re-training of staff within the ministries. It can cause some confusion that the term “diploma programme” is used both for 2-year vocational programmes and 2-year higher education programmes. However the programmes that are considered higher education are only the ones provided by the higher education institutions. A graduate of the University of Asmara received a student copy of the Official Student Record when the program/degree was completed. In addition a Temporary Diploma was issued when the student had completed the National Service (for more information on the National Service, please see own section), which has to be completed in order for a student to graduate. Around 1-2 year after graduation, the student would receive a Final Diploma. A former student of the University of Asmara can also get a copy of the student records at any time, according to the NBHE. It can be issued as many times as the student should wish without any cost, even if the student is applying to further studies or work from abroad. The NBHE manages the archives of the University of Asmara, and their offices are in the same facilities as the former University of Asmara. The procedure today is the same for the new colleges as previously during the University of Asmara period. However, the new colleges have not yet by October 2012 issued any Final Diplomas. According to the NBHE, one should also be able to get a copy of the student records from the new colleges when needed. The transcript, or the Official Student Record as is the proper name, should include information about the student. It should include the name, date of birth, name of secondary school, the student number, the program/degree and all the courses taken with grades. The Official Student Record shows all courses the student has taken and if any courses have been retaken, this will be indicated. It will also include any courses from an earlier programme if a student for instance has taken a diploma programme and then continued to a degree programme, and been exempted from some courses. There is no picture on the document, but it should always be stamped and signed. The date of birth can be written in the Ethiopian calendar system (EC) or in the Gregorian calendar system (GC). We were informed by the Norwegian Embassy in Asmara that Eritrea has had a central system for issuing personal numbers the last five years, and for this reason we will most likely see transcripts with more accurate dates of birth in the future. In transcripts from the University of Asmara, the date of birth was sometimes just indicated with the month and year. It was also quite common to write the wrong date, as the date was often not translated correctly between the two calendar systems. In our meeting with the Norwegian Embassy, it was mentioned that the date of birth is not very important for Eritreans, since many people do not know exactly when they are born. The course codes on the Official Student Record show three numbers in front of each course name. These codes indicate the year, course and semester. This is the same structure used both on documents from the University of Asmara and after the reform at the new colleges. A Temporary Diploma is given to the student after graduation. However, in order to graduate the student has to finish the obligatory national service, as mentioned earlier. A Temporary Diploma has the same value as a Final Diploma when it comes to employment issues and further education. This is the same procedure for both the University of Asmara period and after the reform. higher education institutions will look like. For this reason, all students graduating after the reform only have a Temporary Diploma. The Final Diploma from the University of Asmara was usually issued 1-2 years after graduation. The diploma was done on a very special paper, and a professional artist filled in the name of the graduate. It was a thorough and unique process, which took time and the Final Diploma was difficult to falsify. However, Dr. Mehari from the NBHE informed us that it has not been possible to buy this special paper, which is used for the diplomas, in the last 3-4 years. This is supposedly why the last students graduating from the University of Asmara have not yet received their Final Diploma. The NBHE did not provide us with any information on when they would be able to issue these diplomas. The School of Sawa opened in 2003 and is the only institution which offers the 12th year for all pupils in the whole country. It is mainly an academic institution and the pupils live on the campus. Pupils sit for the Eritrean Secondary Education Certificate Examination at the end of the 12th year. Graduates receive a certificate even if they have failed in one or more subjects as long as they have passed at least one subject. The certificate is called Eritrean Secondary Education Certificate, and it is issued by the Consultancy, Training & Testing Center. For verification purposes, we have attached examples of this certificate for each year, with the correct signatures, since the opening of the school (2004-2012). There are approximately 17 000 secondary graduates every year. About 28 % (5 000) go on to higher education, and 3 000 move on to vocational education. In order to be qualified for admission to higher education, pupils must pass five subjects in the Eritrean Secondary Education Certificate Examination. English and Mathematics are compulsory subjects. In addition, they must take at least three other subjects. Each subject is marked on a grading scale from A to D. F is fail, and a student cannot have an “F” in order to graduate. The letter grades are converted to numerical grades. In order to be admitted to higher education applicants must have a General Point Average (GPA) of minimum 2.0. The GPA is calculated from five subjects: Mathematics, English and three other subjects with the highest results. The best students are placed in the most prestigious programmes. Students with lower grades are placed in diploma programmes (HE) or certificate and diploma programmes (vocational). In accordance with the educational policy of 1991, there is a 7-year period of compulsory education between the ages of seven and thirteen (grades 1-7). Elementary education (grades 1-5) is taught in one of the local languages, while lower and upper secondary education and higher education are taught in English. Pupils study the first 11 years at their local school before they do the last year at Sawa. It is also worth mentioning that there are two technical schools in the country, Asmara Technical School and Winna Technical School. Both have three year programs corresponding to the two last years of the regular secondary school. Pupils attending these schools must pass the Eritrean Secondary Education Certificate Examination (ESECE) and attend Sawa if they wish to enter higher education. National Service is compulsory for all Eritrean citizens. University graduates are not given their diplomas (Bachelor Degree Diploma) before they have completed their national service. The total duration of the national service (Hagerawi Agelglot) in Eritrea is 18 months; this is inclusive of six months military training plus one year of community service (in civilian/military capacity). Most young people complete these 18 months right after graduating from Sawa. The main difference for university students is that they sometimes complete their six months of military training before they enter university and then complete the remaining 12 months of national service during or they have completed all academic courses at the university. However, the six months of military training can also be taken during university or after they have completed all academic courses. If a student does not complete the national service, he or she will only receive a transcript from the university with a note saying that the “The student has completed all the academic requirements, but could not graduate because he has failed to do his university service, which is one of the requirements for graduation” (example from a transcript from the University of Asmara). I bet the "opposition" will start insulting this norwegian agency (NOKUT) for telling the truth. Our good for nothing opportunists know how to crack a lie and peddele it to gain short lived negative campaign. Well, the truth is there for all to see it. The NOKUT went all the way to assess the Educational system and quality and guess what they found? They have found that the decenteralisation of higher Education in the country by taking all the seven departments of the then only University into an independent seven institutions in different parts of the country is indeed a brilliant and bold policy than need to be embrassed than condomned. If you come to the number of enrolled students as well as the location and size of the colleges is indeed far sighted and rewarding. Imagine teaching Marine Biology in the former university in the capital than taking the department out to Massawa by upgrading it in to an independnet college of Marine Sciences right next to the red sea. Who in the right mind is against such policy? Of course, our hasus mesus opportunists in the diaspora, YES. we all remember the so called opposition crying about the university…. everyone now knows they were illiterate bunch of people that didnt know what they were talking about in the first place! They have been beaten by bold facts on the ground that hard to ignore and lie about. These bunch are hopeless and they will do anything to see things goes upside down. Come on hasus mesus …. get a life. Education in Eritrea is the best … remember an Eritrean high school kid invented three Mathematical Theorems that are new to the world? Go and check, it's called "Eritrea's theorem" Is that a sign of deterioration or ??? The main reason NOKUT traveleld to Eritrea is because of the amount of application for relevance of degree from former student of higher education in Eritrea living in Norway. Now, that means the goal of the visit was quality assurance and not amount of student enrolled. Though the reform have been very good in regards to making higher education available for more students and increasing the number of students this report doesn't give any indicator in the QUALITY of the degrees offered by the colleges. How will NOKUT use this information to verify the education of the Eritrean applcants in Norway will be interesting to see, since there is no mention on how the accredation is done, if any quality assurance process is implemented. Lately, you have been acting like a child. Do not pull yourself to a level that is beyond your capacity. One thing that is certain here is you have not been in any of the colleges and you are not even sure what it look like or where exactly they located. So where did your judgement comes from? From Asmarino, Awate or Hassina?? Grow up man. Be a person, a gentle man. For how long you have been allowed yourself to be swayed by articles that are written by some egocentric individuals with own personal purposes. When you say QUALITY, am sure you know what you want to refer. Before I ask you one Q after the other, tell us How much do you know about Asmara University? Have you been a student? Which faculty? Even if you lied, just tell us about that and we will tell you the QUALITY. Advice is never post a comment because you want to. Make your arguments based on facts than hearsay. It makes you even stupid. Tesfanews, did you read what I wrote? How do you conclude that from my comment? The purpose of the report has been defined by NOKUS and that is what am pointing out here! And I repeat they travelled to Eritrea and ethiopia to make an assessment and get a picture on the standard of higher education in both countries. The main goal been quality assurance i would think they would have a thorough look at how this is ensured within the educational system, and honestly I didn't get any of that. Yes, there are more students enrolling and accessing higher school but in terms if the quality we didn't get any smarter, at least not from the report. As for me, I did not grow up there and have not studied there neither. I have mentioned this to some people here, my encounter in regards to the colllege is from some of the Indians working as instructors at MayNefhi, they didn't have the qualification to work as instructors there ( again, this is from themselves, they were surprised they got the jobs..).. How I know this I worked with some of them on a different project during my volunteering. Now, if that is not an indicator I don't know what else is. You first have to learn to read before rushing for comment. The first paragraph below indicated "this reform is not a change on the system" THat means the quality stayed the same….therefore if you are in love with UA you should be more in love with higher number of students. "Eritrea has seen a change in its higher education system in the period 2004–2010. However, this reform is not a change in the system itself, but a change in the number of institutions offering higher education in the country. The system of diploma-, bachelor- (and master-) programmes has remained more or less the same, except for the fact that the number of programs has increased." Well, there is no point talking to you Abraham as you intend to believe more on hearsays than facts. Because you met a less intelligent guy when you work volunteering does not constitute the system of education from where he came from is not quality standard. Either you are less fortunate or more of a peaky kind of guy; if you only know what type of people are working with me that graduated from western universities but i have never dared to question for a bit that they are of less creative and intelligent because the western education system is not that quality. Oh? About recognising our new institutions by Scandinavian or any other university is only a matter of time. Not all new colleges and universities in any given third world country do recognized right away. What NOKUT has done in their first visit and report is the first step that led to recognition. You just reminded me of our Massawa international Airport. When we built it using home grown companies but using the same machinery and science used elsewhere in the world to build such, there were people like you questioning the quality of the work. You know that part of the story: we received President Museveni in that questioned airport without any hassle. When people like you questioned it is because the plane was not that big enough to call it a success, the Pakistani government sends one of its gigantic military cargo plane to prove it’s viability and quality. It was a success. For your information, Massawa International Airport owns the longest runway in Africa. Isn’t that more than a success? The German air carrier Lufthansa doesn’t need any more proof than that to recognizes it as an alternative International airport. They send in their technical team with their giant Boeing A720 to test land and calibrate/map out its coordinate as an international airport. Lufthansa is still using it as a transit for its long flights to Dubai and Doha from western African countries. So hold on your horses for some time and you will here news of immediate recognition of our 7 colleges as an international accredited colleges before they phased out in to a full fledged universities. Mark my word! And guess what, I will be the first to break that news to you. Now you move on …. Tesfanews, you should learn to read, understand before speaking your mind. Hearsay? ?, I told you of a specific example of not only one but two guys accepted as lecturers, on top of that just a month ago I learned a former workmate is also instructing over there…. All three not only are under qualified, they are also aware of this fact themselves… So this FACTS give me a critic to the bone if not a conclusive answer, a hint of the quality!! This is not anything you can talk off or just rub off, it is there and it is a fact. Another thing, I have met and talked to Eritreans all over Europe, Switzerland, Israel, Germany, Greece, Scandinavia and Italy (newly arrivals) and some of them university students, I can swear that roughly 30% of the graduates have a grasp of common knowledge… This is my empirical conclusion, so of course am sceptical when reading reports that glorify an education system that doesnt fullfil certain standards. Not forgetting that the bulk of information to NOKUT was given by the very people that have installed this system. Maybe you have a different one you want to share with us? If the colleges get accredited, which I really hope they do I will be the first to accept and rethink my criticism towards the education system in Eritrea. Though critical I do wish the best for my countrymen, I just don't think this regime is capable of bringing about the changes and strides needed. Massawa airport, now that is news to me too…. Thanks for the update, I knew there was an airport built there in early 2000s but I haven't heard anything if it fulfilled the purpose of its becoming… Something about Massawa being a Freeport, tourist place, resorts and all that. If it is correct what you are saying, don't you think it is a waste of resource that it only is used that little? Specially being the longest international strip in Africa, now that is a shame. Maybe you can share with us the reasoning behind the decision to built it in the first play, and social, economic studies, visions to back up this decision? Cause to me, an airport with that standard should be buzzing with traffic, which Massawa airport isn't. Massawa Airport is news for you, eh? Many many things are news for you brother Abraham. The readings you were frequenting in those good for nothing websites doesn’t help you to know the good stuffs that were going on in your home country. How bad. A mind is a terrible thing to waste brother. Now, follow the following video very carefully. That was about the first flight Lufthansa made to Massawa airport. As you will find out, the Lufthansa chief was so impressed of the new airport and said ” I wish Massawa airport was in Asmara.” Take note that the video is for 2011 but the airport was built 7 years ago. For the question you raised as to why wasting resources on the airport, shows only how shortsighted you are. I have clearly seen how completely you are detached from your country Eritrea. People like you were asking same [silly] question about national service in early 90’s. Why wasting resources that can be spent elsewhere than training thousands of youth in military technique. FARSIGHTEDNESS is the hallmarks of Shaebia. You better get that in to your thick head. Well, you sure set the standard for this website with your insults. What was it you said was the code of commenting here again, some months ago that is. Maybe you should read your own rules for ones. Looks like I have to give you all on a silver spoon, your info regarding the airport was news to me.. I was there when it was finished, right before opening, but again I wil ask you how much traffic has been generated since its opening 7yrs ago? Any statistics? Flights per day, week? Has it in its 7 year life contributed in the socio-economical development of the surrounding area? Any maintenance cost compared to,generated income? There are very many questions to ask, questions that will give us answers into how projects are started/planned in Adi…since there is no arena for such debates in the public space. You know even North Korea has built nuclear weapons and have mastered this technology, that doesn't mean it's people are living a better life standard. Ohhh, before you comment…take a look at your rules on site behaviour, you should walk the talk like all of us. Mr. Abraham, well if u can see above your nose, then this is a future investment. As you see Massawa sits in a very stragetic next Dubai & Jedda. Therefore, we will bring you all the necessary documents that you asked when the time comes. Be patient! Well, what happened to my answer? Tesfanews, now be proffesional and publish answers to your own comments, at least that will show your believe in yourself and your news. I know my answer didn't breach any of the laws of conduct here so you man up bro. I know you know that you breached your own laws with the insults in your comments above, and thereby setting a new standard (or should i say a low point…) but dont worry, i forgive you and will not sink to that level myself. One more thing Tesfanews, don't mistake Shaebia for PFDJ… those are two completely different entities. Sheabia were heroes!!!!! But Shaebia doesn't rule Eritrea now BASTA. Asmerom, and there you proved my point! Do you know what the main objective of the visit by NOKUT was? What initiated the visit in the first place? It was quality of the education, in order to have a basis for certifying the applications from former student of UA residing in Norway now. Abreham…..Same Quality + an increase in number= better. I thought you and all UA lovers were in love with it because of its quality. Therefore if the quality stays the same with almost quadruple number of students isn’t it better. You claim the main objective of the visit by NOKUT was its quality of the education, in order to have a basis for certifying the applications from former student of UA residing in Norway now – Since you agree with the quality of UA and the quality stayed the same; I see no problem on the application of the former student. Asmerom, yes maybe you are right there i don't know. As with all reforms there is going to be changes in the qualty shifting either way. It all depends on how the process is done and if there has been any controll mechanisms to evaluate the process and the result after the implementation. Thanks for being proffessional in your comments. This place is full of angry defensive people. One can't write one critical word without being called all tye of names weyane, idiot..even Tesfanews, the publisher has resorted to this. It shamefull!! Tesfanews, stop talking to the Ethiopian/TPLF cadre "Abraham" and block him. This guy has held your website hostage with his hateful vomits of delusions. You engaging with this moron only makes yourself and your website less worthy. Get rid of the cancer, thank you. BTW, great read, thanks for posting! guys, facts not insults. That is the only way to go. Give me the facts and challenge my comments with the truth, only then will you be credible. betri haqi tiketin imber aytisiberin iya!!!! exactly Abraham is Agame moron don't waist your time, he doesn't know, because he is Aid addicted nation across the board. I have been reading this post and comment for a while today and have seen some of Abrahams comments. I didn't see any problem with them. He needs to be educated and what we are doing here, insulting and mocking him is not correct. Tesfanews, please as a publisher we expect more from you. Your well written answers and links will eventually educate this Abraham, but don't kick out his comments because you don't like them or don't agree with it. As long as he behaves, let him come to the lion's gate for more of our Eri wisdom. Abraham , you are what they call a DIVA don’t over act because you are no body recognized by any body. I can personally testify that the educational system is significantly improving. I visited Myie N'fihi and I was happy with their efforts despite the lack of teaching staff and texts. Much more work is needed in that department but efforts to send text from abroad and the diaspora returning to teach is greatly appreciated. Asmara, 6 March 2013 – Asmara Teachers Education Institute (ATEI) has been upgraded to Community College. The new college, titled “Asmara Community College of Education,” has started rendering diploma courses in line with the certificate course it has been providing. Mr. Alem Gebrekal, Director of the College, said that the nurturing of diploma graduates in the field of education is a vital prerequisite for enhancing quality of basic education. He further explained that the process of upgrading the Institute involved a 3-year venture in drawing a sound curriculum and recruitment of 45 competitive instructors. Ferdos Si’ud, a Certificate student, Mohammed-Seid Amr and Walta Kiros expressed satisfaction with the upgrading of the Institute, and said that such opportunity is a remarkable opportunity for a number of nationals seeking career development in the domain of education. Furthermore, they commended the commitment of lecturers, and disclosed that there are ample facilities in the College. Asmara Community College of Education has so far registered 730 students. I was following all your comments and communications. When we saw comments from a person like Abraham it is really hurts the people who worked in this colleges. There are so many points to mention here but not needed at least for now. Abraham you looks educated I appreciated for your comments and concerns of quality. Believe me the quality of education is by far better than before. I will keep you updated on Hamelmalo Agricultural College that comes out from Asmara and how much the college is progressing in terms of Education, Research and Development. But for now be sure what you are commenting is good for the future of our young generation. It is a matter of time to see for your self and believe on what you are commenting. Remember that all the known universities has passed through stage of development before they are recognized.